If you’re planning to setup a new website, you might want to consider Drupal. Drupal is a content management system (CMS) as well as a content management framework (CRF) that is open source, and free to use for any purpose. Drupal in its most basic form is known as Drupal core, which offers basic content management tools such as an RSS feed, user accounts, page layout customizations, and a variety of other tools. Drupal can be used for almost any purpose and requires only PHP and MySQL to operate. The versatility offered by Drupal core has made it one of the world’s most popular CMS to use for websites of all shapes and sizes. As a result of being an open source platform, Drupal has accumulated large popularity and a huge following which has lead to a large amount of user generated add-ons. These add-ons are known as contrib modules, and they can be employed by anyone to add features, appearance changes, and functionality to the basic Drupal Core. The accessibility of Drupal as an open source platform has allowed a strong community to form around it and most of the development done by this community is provided free for everyone. The number of available contrib modules continues to grow as users set out to shape Drupal to fit their personal needs. If you’re looking to setup a Drupal based website for any reason, there is likely a contrib module that is perfectly suited to do exactly what you want. 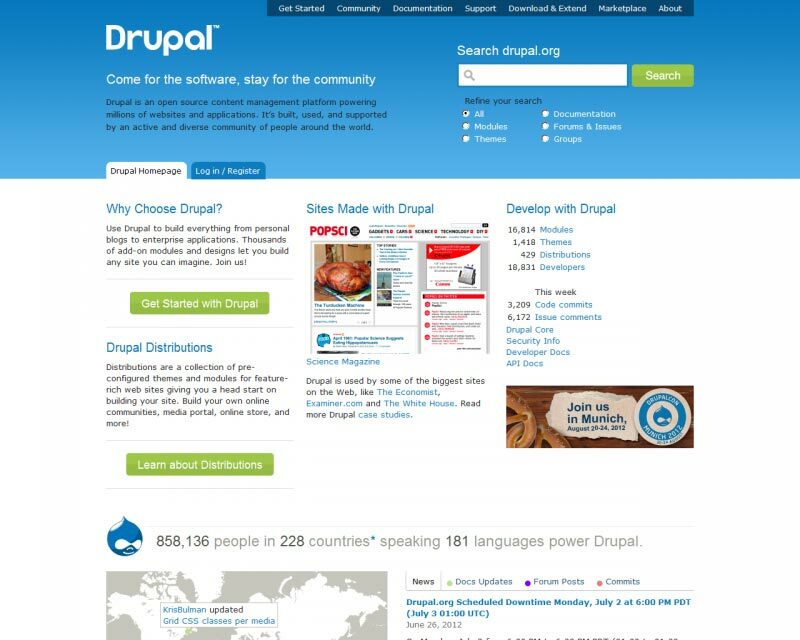 Drupal’s was first created in 2001, when Dries Buytaert developed it to be used as a message board. It slowly began to gain popularity, among web developers, in 2003 when the political candidate Howard Dean used it to create his own website for the 2004 U.S. presidential election. While Dean didn’t win the election, his website was tremendously successful at helping his campaign. As a result, many more websites have begun using Drupal in the years since such as Nvidia.com, Mattel, Intel, AT&T, Zappos, Whitehouse.gov, and many more. In fact, as of 2012 hundreds of thousands of websites are currently using Drupal in some fashion. Many of the popular sites you use every day are running Drupal. It’s a powerful content management system that allows you to get up and running quickly with your site and it’s completely free. In order to understand how Drupal has become such a successful open source CMS, one must first understand its core components. Core is also known as Drupal default, or in other words it’s the stock version of Drupal you get with a fresh download. While this configuration has no user generated contrib modules installed, it still contains a plethora of content and is more than enough for most website needs. With Drupal core, a taxonomy system is employed to organize and keep track of Drupal Core’s content library. While open source platforms can often be difficult to use for the average web developer, Drupal is extremely simple to download and install for personal use. Furthermore, recently developers have expanded Drupal’s number of available languages so that it may be used all around the world. This makes Drupal an excellent option no matter what your needs. If you’re looking at starting a new website, consider using Drupal and Drupal Web Hosting, you won’t be disappointed.